The interviews behind My President Was Black. 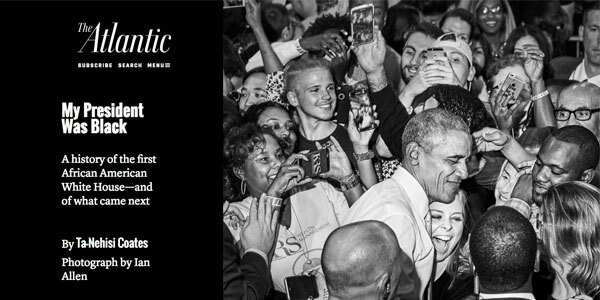 In addition to his tome of a cover story, My President Was Black, for the January/February issue of The Atlantic, also available in an audio version that clocks in at 1 hour, 33 minutes and 19 seconds, Ta-Nehisi Coates has been publishing installments of the transcript of his interviews with President Obama conducted for the story. The fourth and final installment was posted this morning. It is the only one that took place after the election, conducted over the phone on Nov. 17, and one that both agreed was a brief follow-up to the more substantial conversations that preceded it. Even with the added context of knowing the results of the election, this final interview is rather anti-climatic, probably because Coates’ previous interviews went so far beyond the scope of this current election, this particular point in history, beyond even the eight years Obama himself spent in office. The questions Coates asks and the stories and ideas the president reveals, merge the personal with the political and the historical, encompassing everything from slavery to the Civil Rights movement to postwar Germany, creating an utterly compelling read.